In the midst of another afternoon of work, laundry, nose-blowing, and tea-swigging, I noticed some pretty light in our bedroom. I threw on a skirt, bundled my scraggly hair into an arrangement that could sort of bear passing scrutiny from one angle, swept all the magazines off the top of the dog crate, prodded my husband out of bed, and thrust the camera at him. Because a gal’s got to take a chance to shoot a new sweater when she can. 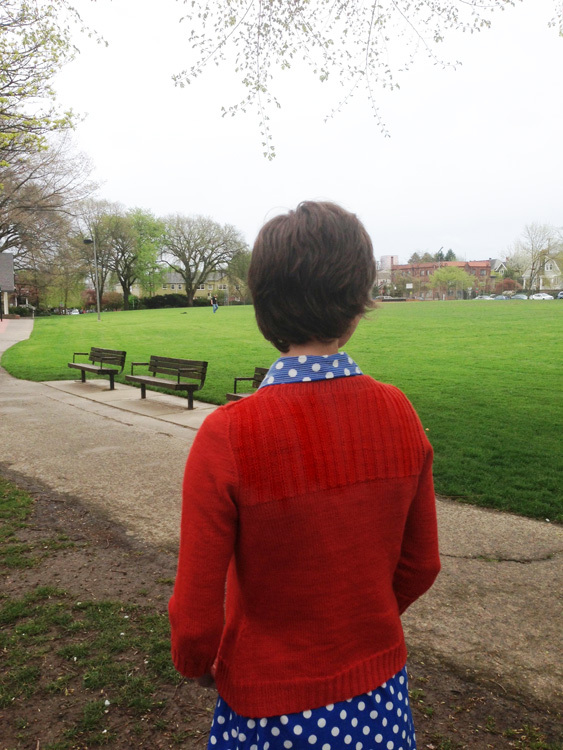 We didn’t even get to a pose that would show you the back before Mr. G had to croak his way through a business call and I had to pick up our daughter from school, so you won’t have seen the last of this cardigan, but for now… it’s something, anyway. 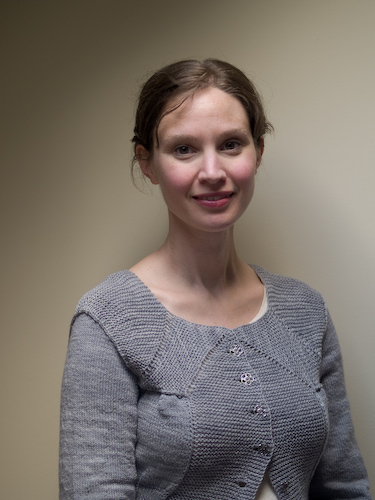 This is the Mitered Cardigan from Knit One Knit All, the new compilation of previously unpublished Elizabeth Zimmermann designs in garter stitch. The yarn is Fleece Artist Merino 2/6 in a grey that makes me think of gulls. It came accidentally to the knitting shop where I used to work and the owner let me have it at cost rather than paying to ship it back; it’s been resting in my stash ever since. It was lovely to knit and I’ve still got several skeins left to play with. 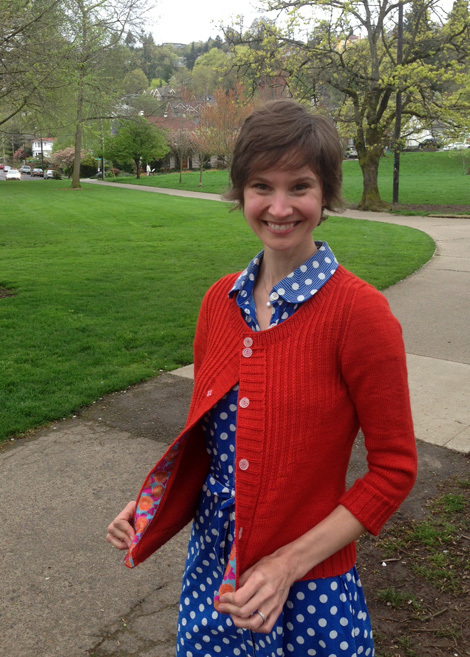 Like so many of the wild and wooly ideas born of EZ’s fertile brain, this cardigan is unique. One knits a long strip of garter stitch, turning corners according to the instructions, to construct a sort of cardigan frame. Then one fills in the torso and adds sleeves. It’s not for beginners, those who fear math, or those who shun gauge swatches. 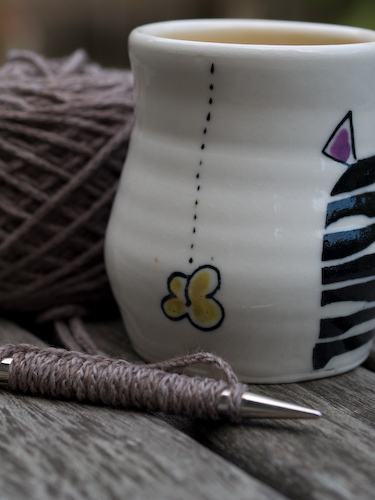 As experienced as a knitter as I am, and as careful as I thought my calculations were, my sweater wound up about two inches shorter than I’d expected because I didn’t take the time to make a swatch that really mirrored the construction of the sweater. 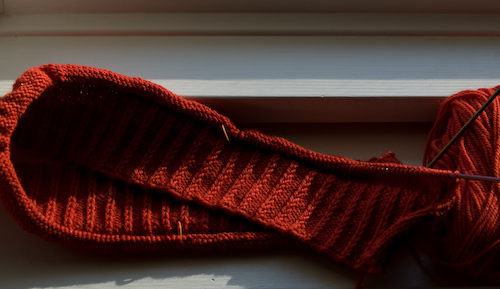 If you want to make this yourself, I encourage you to first knit an actual mitered corner in garter stitch, pick up stitches along one interior edge of it, and then work stockinet back and forth, saddling those stitches to the vertical edge of the garter strip. Only by measuring the resulting compression of the garter stitch will you be able to get the fronts of your cardigan the length you want them. And it’s all or nothing with this sweater — there’s no way of employing your usual tricks to solve fit problems after the fact. You’ll pretty much have to rip the whole thing if you don’t get it right the first time, or at least be willing to chop it into pieces and graft them back together with fabric added or removed as necessary. When I started knitting last summer, I had my own bright ideas about improving the fit that weren’t entirely well advised. I added too much waist shaping, for one. Well, I added my usual amount of waist shaping, but my gauge was tighter than what I’d swatched; the result was too snug a fit at the waist. And then I went and grew a pregnant tummy, so it will be six or seven more months before I’ll know whether I can actually button my cardigan all the way down. I also thought I’d get a little fancy with some extra fabric at the bust and then a pleat to gather it back in. The extra fabric was a good idea; I’m not crazy about the pleat, which isn’t really big enough to look like more than a pucker. I’ll do that differently next time. I love everything about the fit of the sleeves, though. The sweater looks pretty much identical in all the pictures we took, so it wasn’t a very successful effort as a documentary of things knitted. (It also hasn’t been blocked. Oops. I promise the fabric will be smoother next time you see it.) But just after we staged this impromptu shoot, my friend Kristen began writing a series on the male gaze in knitwear photography, and from that perspective I find scrolling through our pictures rather intriguing. The post I’ve linked is about the spouse as photographer — apropos for me because hardly anyone else takes pictures of me. The top photograph is a view of myself I never see. But my husband must see it all the time as I’m concentrating on a set of complicated stitches, reading a book, working at the computer, interacting with our small child… I suspect I spend a great deal of my time gazing downward. Is my brow usually more furrowed? Do I look less tranquil? Very likely. The next snap is one I wouldn’t post unless I were thinking about what the camera captures, but it’s the girl I see in the mirror these days: two months of illness and two trimesters’ worth of weariness in the shadowed eyes, a weak smile that doesn’t reach beyond the lips. Her face isn’t even quite in focus, although the sweater is — truth inadvertently revealed by a fixed-length lens. This girl is spread thin and not living fully into herself. I’d like to see the back of her as soon as possible. In the presence of a camera held my someone other than my husband, I imagine I’d have been artificially perky, more conscious of the self I was presenting, more eager to please the viewer. … because there’s more of me in it. It was taken before the two where I’m looking down but after the tighter, tireder shot. I’m about to say something tart to my husband, who’s just told me my belly looks distracting and I need to cover it with my hands and also put my shoulders back, which I’m going to do because he’s right even if he isn’t always tactful. The flare in my nostrils and the tightening of my lips and jaw rather spoil me as any sort of inviting picture of womanhood, but they’re true. And because my husband-photographer loves me in spite of my broad saucy streak, he gets to capture that. And it’s probably not inappropriate to wear a saucy expression while modeling an Elizabeth Zimmermann sweater… I like to imagine that great lady could answer back with the best of them when the occasion required. No one who wasn’t a little bit flippant could have turned the knitting world on its head as she did. Mitered Cardigan being an accurate but unpoetic name, I’m calling mine Heart Elizabeth. Because I do. In sickness and in health. I’m down with crud. And I don’t mean “down with” in the slang sense of being willing to do something or endorsing the idea of it. I mean “down with” as in “feebly prone on the sofa barely energetic enough to knit more often than not for the past nine days.” But I drafted what was supposed to be a quickie post two weeks ago, and you might as well have it until I can muster the vigor for something better! Stay healthy, everyone. No, this isn’t a tiny espresso cup. It’s just a really big needle. The biggest I own, in fact. In my opinion, knitting with a #11 is a lot like eating a bowl of ice cream with a ladle. Yes, it goes quickly, but it’s terribly awkward and then it’s gone so soon. But I can’t get within a country mile of gauge for Idlewood on the recommended #10. This yarn, though? 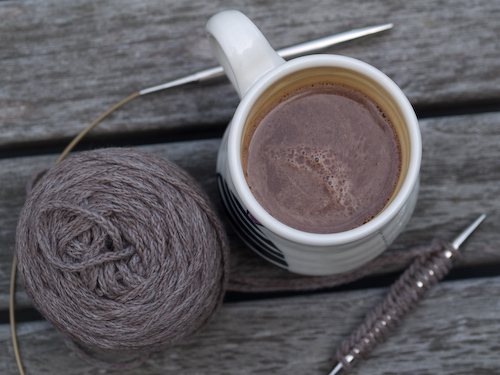 Every bit as velvety delicious as the hot chocolate in my mug. Well worth the money even at Cascade’s new higher prices — at least that’s my opinion upon swatching it. I haven’t had a chance to test its durability yet, but the cabled construction of the buttery 70% merino – 30% baby alpaca blend ought to help it last. Eco Cloud only comes in undyed colors (this one is Otter), but there seems to be a new dyed version called Cloud available, too (not to be confused with Cascade’s Cloud 9… choosing such similar names seems a baffling decision from the Cascade marketing team, but then so is giving more prominent placement on one’s website to news of lawsuits against one’s rivals than to one’s own products, in my opinion). Anyone care to lay odds on my not relinquishing this to Katrin at Christmas time? Update: I felt like Goldilocks trying to find needles that would put me in the neighborhood of the right gauge, but it was accomplished at last and I’m off and running on that luscious big cowl. Still loving the yarn.